Some stories can be reduced to a brief summary with the popular phrase, “In a nutshell.” The Hammerton story is better abbreviated with, “From a pinecone.” Indeed, this unassuming little collection of seedpods is a mighty symbol of both our organic heritage and the extraordinary artisan metalwork that still distinguishes our work today. 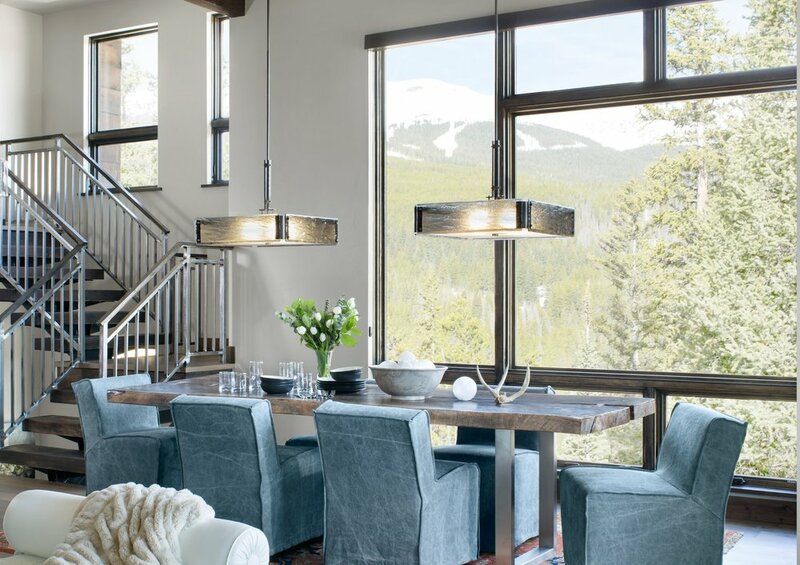 Back in the 1990s, when Hammerton was busy crafting light fixtures for booming ski resort markets throughout the intermountain West, our most popular look of the time was a rustic mountain organic style featuring life-like textured evergreen boughs laden with needles and pine cones — all meticulously handcrafted from steel. We created thousands of pinecones, ultimately patenting the process that enabled one artisan to handcraft 3-4 of them per hour. A time-consuming process, but one that the market clearly desired. Today, the pinecone is not only a symbol of our organic roots and our USA artisan-made craftsmanship. Remarkably, it’s still the most popular organic motif from our Log & Timber collection. Indeed, great design never goes out of style! Above we’ve featured a few of our favorite Log & Timber designs featuring the iconic Hammerton pinecone, along with an inside look at their fabrication. Let us know what you think! If you'd like to see more point-cone laden fixtures from the Hammeton Log & Timber collection, please click here. The dome style of light fixture has been around as long as the lightbulb -- literally. In the first years of the 20th century the earliest commercial electric bulbs were scarcely brighter than a gaslight flame, so housing multiple bulbs together within a single glass dome was a common sense solution for achieving greater light output. The rest, as they say, is history: dome fixtures quickly became the utilitarian default for overhead lighting in everything from commercial warehouses to closets to cars. Today, the humble dome enjoys higher status as the interior design world has embraced its decorative potential, and Hammerton celebrates this marriage of design and function across a wide range of styles and forms. We fabricate in blown glass, kiln-fused glass, rawhide, acrylic and other materials, incorporating decorative accents such as blown glass finials, organic silhouettes and decorative metalwork. Below are a few examples. Above, a simple frosted acrylic dome creates a warm and welcoming entryway. Pins and strapping in hand-forged steel surround the dome, quietly nodding to the home's Craftsman style. Again, another simple dome is featured above -- but the decorative band of scrollwork and finial take it in an entirely different aesthetic direction. As shown: a CH9109 from the Hammerton Chateau collection, in light mica, onyx acrylic, and a Brushed Pewter finish. Photo courtesy of McKinley Masters in Calgary, Alberta. Above: A Lake Tahoe estate features two very different approaches to the traditional dome fixture, both from the Hammerton Craftsman collection. At left is the octagonal CH8095, nearly 4 feet in diameter, in light art glass with a Stippled Antique Iron finish. At right is the CH8104, 27" in diameter, in light acrylic and a Brushed Antique Iron finish. Photos courtesy of Dennis E. Zirbel, Architect. Shown above and below are two-tiered dome fixtures from the Hammerton Craftsman and Log & Timber collections. The CH7161 in the rustic interior above is 45" in diameter, with shades in lashed rawhide, a dome in dark acrylic, and an Antique Bronze finish. Photo Courtesy of Centre Sky Architects, Big Sky, MT. Below left: is a modified CH7161, and below right is a CH8112, 4 feet in diameter, in light acrylic with a River Rust finish. Above and below, bowl designs from the Lightspann collection shown in various settings. The entry fixture shown above left is a modified CHA0015, with a frosted bowl and Tiger Eye funnel. At right, a dining chandelier featuring three CHA0016 bowls in Sea Tide blown glass with Iridized Gold edge wrap and clear ribbed ball finials. In the wine cellar below, a custom fixture in kiln fused Frosted Crystal glass and hand sculpted steel. Photos courtesy of Staprans Design, Portola Valley, CA. Above, dome chandeliers from the Hammerton Chateau collection extend an old-world aesthetic through this traditional European style home. Left and center are two modified versions of the CH9109, at right is a CH9066. Above, a CHA0014 from the Lightspann collection. With 3 layers showcasing frosted kiln-fused glass, Aurora Gold blown glass with an Iridized Gold edge wrap and a Tiger Eye funnel, this fixture is truly a work of functional art. We leave you with this detail of a unique bowl fixture featuring three graceful tiers of custom kin-fused glass, recently fabricated for a Colorado client. Photo courtesy of AP Resort Concepts, Vail, CO. This popular design family from the Hammerton Chateau collection shows how a marriage of old and new can be marvelously magical. Fondly called 'Chateau Redux', these fixtures feature time honored, old-world silhouettes updated with clean contemporary lines and subtle artisan details like hand-forged finials and delicate scrollwork. Their surprising simplicity and airy elegance suits a wide range of interior styles, from classic to contemporary. 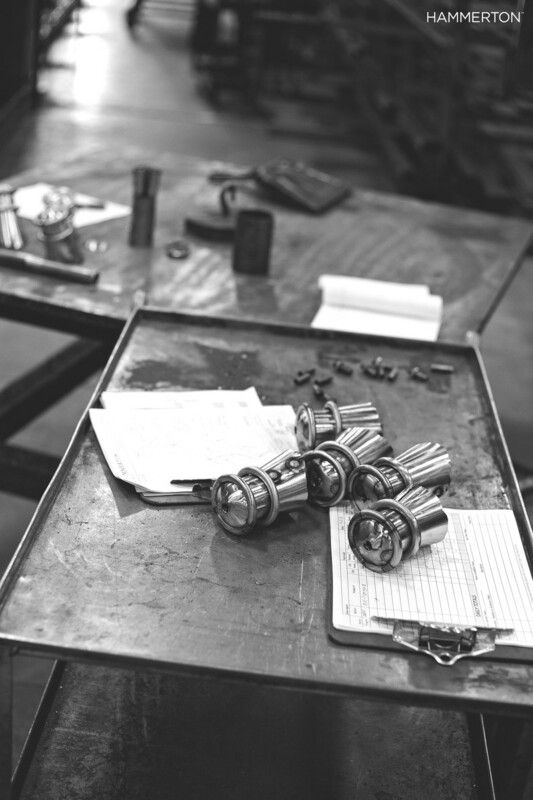 A wide choice of decorative options and finishes expand the design potential of each fixture. For example, wax candles paired with intricate banding and tumbled quartz crystal swag lean more classic, while steel candles or cylinders and steel swag lean more contemporary. Below are a few photos of Chateau Redux fixtures from a designer client's own home in Southern California. Her choice of wax candles and beaded swag provided the perfect counterpoint to the traditional style of her interiors. See a fixture design you like but need it in a different look? Scroll through the film strip below for more ideas! Is there any light more versatile than the drum? We think this workhorse fixture deserves much more than a white shade. By incorporating eye-catching materials and textures -- think fused crystal, textured kiln-fired glass, woven steel mesh and more -- drum lights can dramatically elevate interiors instead of simply blending into them. At Hammerton, our most popular drums are those that juxtapose unusual materials in visually engaging ways. Take a look at a few of our top sellers below. Above & Below: A 2014 remodel of the Hilton Houston Southwest makes strategic use of contemporary drums in fused crystal and fine woven mesh to update the look and feel of the hotel's central common areas. Below: A few of our most popular triple drums featuring fused crystal, textured kiln-fired glass and steel mesh. Below: A triptych of triple drums in the DeJoria Conference Center at High Star Ranch in Kamas, Utah. Much of the custom residential work we do at Hammerton involves creating signature lighting packages that address all the decorative fixture requirements of the home. These 'whole-home' custom services enhance the overall design integrity of a project by providing consistency in aesthetics, scale, proportion, finish detail and quality -- without the generic look that frequently results from using the same brand of lighting throughout. And since each whole home project involves a dedicated team of Hammerton design, engineering and service personnel, additional benefits include streamlined project management as well as delivery and budget control. Below is an inside look at a recent whole home project that is currently installing at a northern California lakefront estate. 68 custom and modified catalog fixtures representing 21 signature designs blend the timelessness of old world European elegance with the warmth of organic style. By offering a combination of distinctive and shared design elements -- including distressed edges, decorative pins, joints and straps, scrollwork, twists, light-hued diffusers and complementary finishes -- each fixture design stands on its own while collectively unifying the home's overall aesthetic. Stay tuned... we hope to show you the completed home -- including many fixtures not featured here -- in a few months! Above: unfinished outdoor sconces just out of the fabrication shop provide a good view of the extraordinary design detail in their distressed edges and decorative pins and strapping. Below: the finished outdoor sconce. Above: two additional outdoor fixtures. On the left: several fixtures in this post mount style illuminate the driveway. On the right: the entry pendant. Each of these outdoor fixture designs subtly introduce aesthetic elements that are carried throughout the interiors. Above left: This window-style drum was designed to visually punctuate key traffic areas on the main floor. Its ornate twist detail is echoed both in the main hallway sconces (above right) and in the adjacent wine room dome fixture (below) to visually unify the separate spaces. Note also the subtle scrollwork and hammered flare detail which are repeated in many of the other interior lights. Below, the 9-foot tall great room chandelier -- a very different design than those above, but with many familiar design details. Also, note the octagonal pendant in the chandelier's center: though it plays a supporting role in this enormous fixture, it takes center stage as a multi-port pendant chandelier in the home's magnificent floating circular stairway (not shown). Above, the two kitchen fixtures. At left, a multi-port chandelier that will hang over the peninsula. At right, the 53" diameter island chandelier. 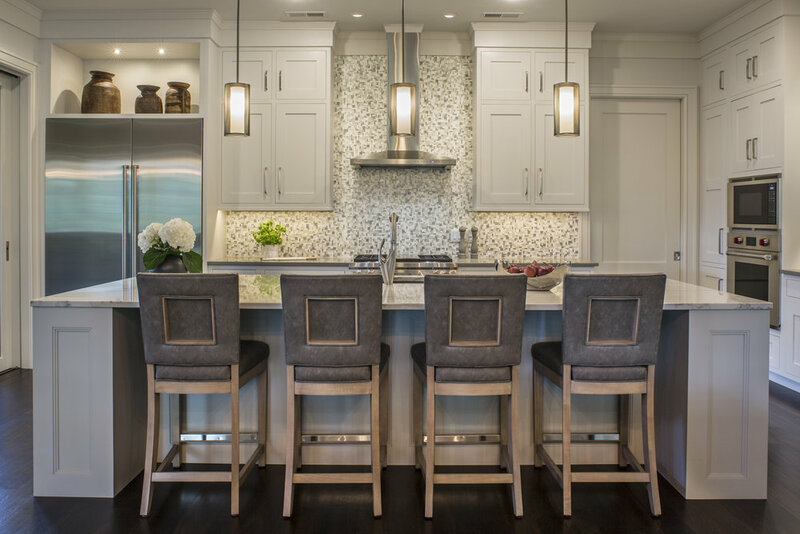 The scalloped shades, used exclusively in these kitchen fixtures, are intended to distinguish the space separately from the adjacent great room, although the overall aesthetic is unmistakably similar. In more private spaces, the homeowner opted to incorporate a warmer organic style that still nods to the timeless elegance of the home. Above left, the master bath chandelier. Above right: a gracefully sculpted linear suspension that will hang over the master tub. Above, two additional organic-inspired fixtures intended for secondary bedroom spaces. Below, lamping cups used in the above left fixture. This sleek, old world-inspired candle light sconce features soft clean lines echoed in a graceful strand of crystal beads. Melted wax candles and elegant metal curves lend an authentic, traditional feel to this modified Seriph chandelier. This cylindrical mesh fixture in a contemporary black finish features strikingly clean lines and four simple candle bulbs. 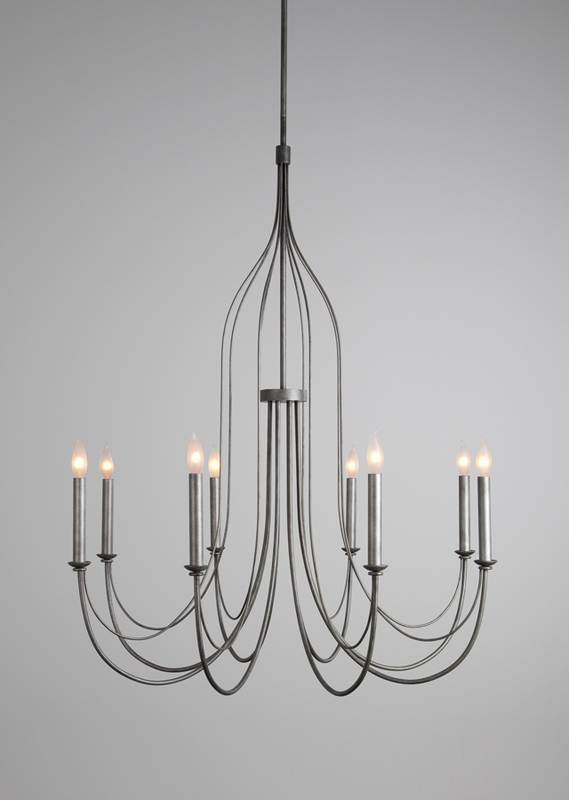 This candle light chandelier's trendy industrial vibe is enhanced by a stainless steel finish and a stunning mesh shade. 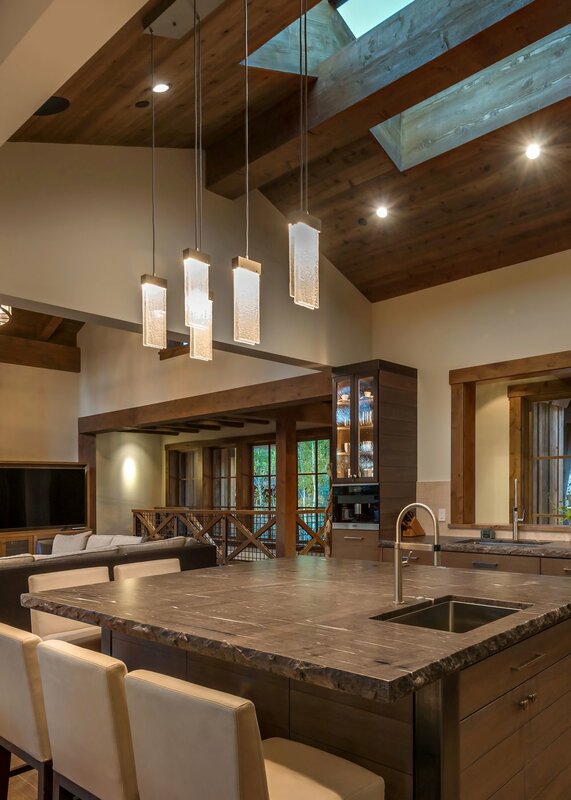 With a rustic nature motif and a warm rawhide dome, our skilled artisans created this one-of-a-kind chandelier design for a transitional mountain home. Defined by a sculptural moose motif crafted in bronze, this classic lodge-style candle chandelier features stunning metalwork and artisan detail. With 11 glass shades and a strong, linear form, this fixture's bold aesthetic is beautifully balanced by a series of small, delicate candles. This Craftsman chandelier's melted wax candles and brushed antique iron finish is suitable for both transitional and Arts & Crafts style spaces. This fixture's unique circular shape and sleek metal candles are defined by a distinctly modern aesthetic. This candle fixture's bold geometric form and hand-applied finish can complement a wide variety of interior styles. As our days start cooling down, there’s nothing quite like coming home to the warm glow of a custom candle light fixture. Once relegated to rustic spaces, candle light fixtures have taken on a fresh, new form and a distinct contemporary aesthetic, making them a versatile choice for today’s more modern homes. These distinctive lights capture all of the beauty and ambiance of a lit candle while offering numerous design possibilities to suit your home’s unique decor. Whether traditional, contemporary, or somewhere in between, all of Hammerton’s expertly crafted candle light fixtures exude a time-honored aesthetic with a sophisticated, modern twist. 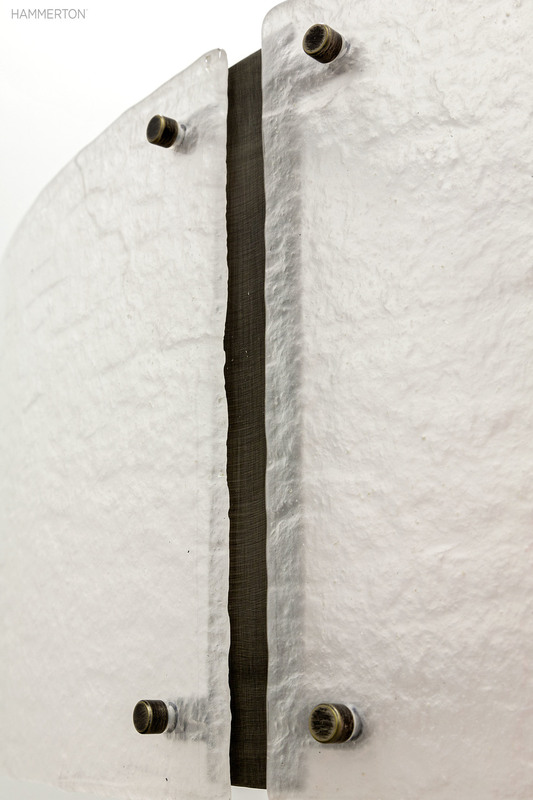 The type of candle base used in each fixture dramatically impacts the overall aesthetic. For example, melted wax candles are perfect for traditional and rustic-style homes, while steel-base candles add a industrial-inspired element to more contemporary interiors. 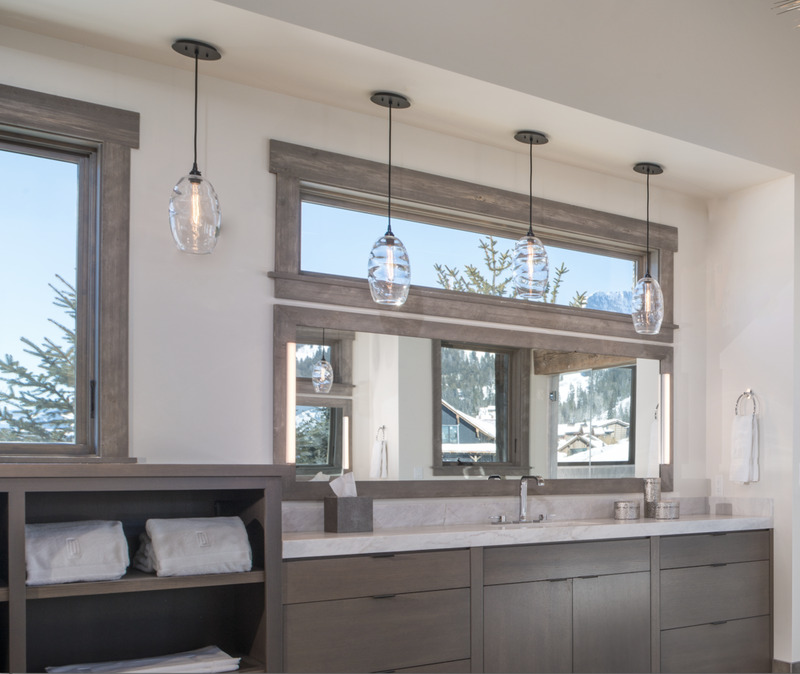 Our mastery of design and metalwork allows us to craft these elegant fixtures with clean lines and simple forms that work well in a variety of spaces. You can view some of Hammerton’s most recent custom candle light fixtures by clicking through the gallery above. If you’re interested in including one of these finely crafted candle light fixtures in your home, or if you’re interested in creating your own custom piece, contact Hammerton at 801.973.8095 for a design consultation. A simple ceiling fixture featuring a simple form and subtle old world details adds a transitional design counterpoint to this cellar's natural stone masonry and rich mahogany. For the stacked stone hallway, interior designer Randi Skiffington chose a simple sconce design featuring an old world stem to enhance the room's European feel. Graceful curves were combined with a bold use of antique iron-finished steel to achieve this unique custom ceiling fixture, which serves as the centerpiece in the cellar's tasting room. Double-light sconces echo the design elements of the central ceiling fixture and wash the stone walls with light, enlarging the room and highlighting the room's stunning finish details. We love to feature American artisan manufacturers who share our high standards for aesthetic and functional design. Charles River Wine Cellars is an excellent example. What started out as a simple passion for beautiful wine cellar designs launched Edward Loughran into a world of specialty varietals and high style storage solutions. As a stonemason by trade, Loughran’s attention to high quality craftsmanship can be seen across New England. Indeed, his personalized designs — whether for wine tasting or showcasing — all reflect the artistry and complexity of winemaking itself. In 1999, Loughran founded Charles River Wine Cellars after assembling a strong group of professional artisans and designers. Fusing a dual passion for craftsmanship and fine wine, every cellar design executed by his team reflects the exceptional skill and impeccable quality of numerous custom features, ranging from LED accent lighting to weathered stone accents. Loughran’s affinity for high quality materials, excellent craftsmanship and sophisticated artistry naturally struck a chord with our team at Hammerton. In a collaborative effort with designer Randi Skiffington of Interiors By Randi, a beautiful wine cellar design was completed for a client’s home on Lake Winnipesaukee and finished with several of Hammerton’s elegant, old world-inspired light fixtures. Click through the gallery above to view this stunning Charles River Wine Cellar design featuring luxury light fixtures from Hammerton. To learn more about how Hammerton can work with you to create custom lighting designs for a commercial, hospitality or residential project, contact us by emailing info@hammerton.com or calling 801.973.8095.